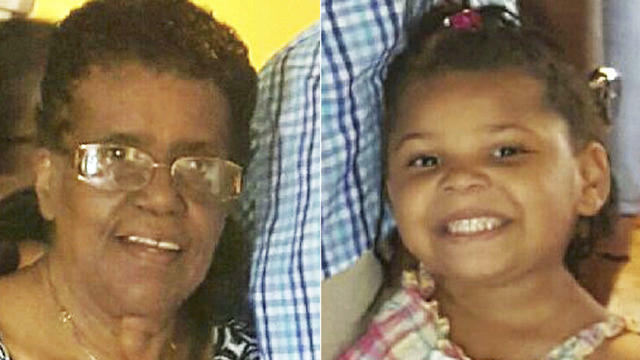 RICHMOND, Va. -- A New Jersey woman and her 5-year-old great-granddaughter were found alive in Virginia on Wednesday, days after their disappearance during a holiday road trip prompted a multi-state search, authorities said. Barbara and La’Myra Briley were found near their vehicle on private property in Dinwiddie County, south of Richmond, just before 5 p.m. Wednesday, Virginia State Police spokeswoman Corinne Geller said in a brief statement. They were parked at least a mile from a paved road, the statement said. Barbara Briley, 71, was flown by helicopter to VCU Medical Center in Richmond for treatment and was listed in serious condition, according to the statement. La’Myra appeared unharmed but was transported for medical evaluation. A property owner had seen the car from afar, went to check on it and found the two sitting against a tree not far away, the statement said. Barbara Briley was unconscious at the time. Maj. William Knott of the Dinwiddie County Sheriff’s Office said the man had seen news reports, realized who the Brileys were and called 911. “This person probably saved them,” he said. Barbara Briley was “not responsive to questions” when authorities arrived, but La’Myra, who has since been reunited with family, was “in good shape and very talkative,” according to Knott. Sources told CBS Richmond affiliate WTVR-TV Barbara Briley was very confused in the hospital. She was listed in serious condition. The VSP said evidence points to Briley having pulled off a dirt road into the woods and driven over a small tree, getting stuck in the remote area when she tried to back up. The two seem to have been there for several days but had drinks and snacks to get by. A relative of Briley’s reached by The Associated Press declined comment, and VCU Medical Center didn’t immediately return a message. The Brileys left New Jersey on Christmas Eve to visit relatives in North Carolina but never arrived. They had last been seen Saturday at a gas station in Ruther Glen, Virginia, about 30 miles north of Richmond. Family members have said Barbara Briley was a former driver for New Jersey Transit and had made the long trip numerous times. They also said she didn’t have any known medical issues. Surveillance video from the gas station shows Barbara Briley walking inside about 5:40 p.m. Saturday. She exits and re-enters before eventually pulling away just after 6 p.m., authorities said. Gas station clerk Joanna Strange told local media that Briley came inside to say she was lost and that she helped her with her GPS before Briley went on her way. State troopers had searched in the Ruther Glen area and then re-centered their efforts along the Interstate 85 corridor from south of Richmond to the North Carolina line, state police spokesman Sgt. Stephan Vick said. They used a helicopter and hunted for signs of guard rail damage or other evidence that a car may have run off the road, he said. The North Carolina Highway Patrol also assisted in the search. The investigation was being led by Hamilton Township, New Jersey, police, who didn’t return messages seeking comment.